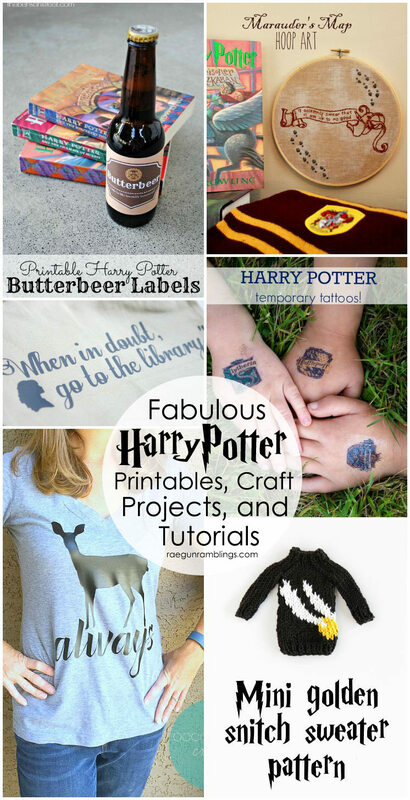 Harry Potter printables, tattoos, knitting patterns, home decor, and even a shirt. That’s what day 3 of Happy Harry Potter has for us today. I swear each day when I check through all the awesome new posts I’m blown away. I am having so much fun! I squealed out loud when I opened Emily from The Benson Street‘s email with this awesome photo. 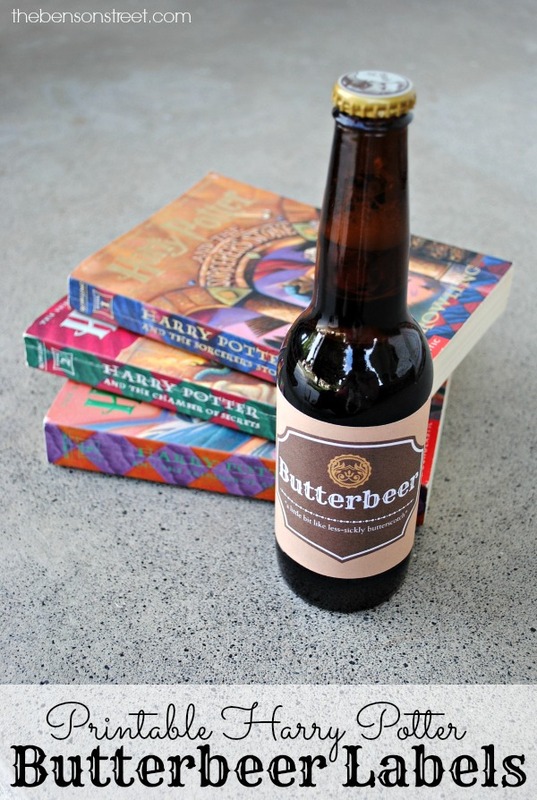 Printable Butterbeer labels, too too cute. Seriously I cannot wait to have another Harry Potter party and use these babies on everything!! 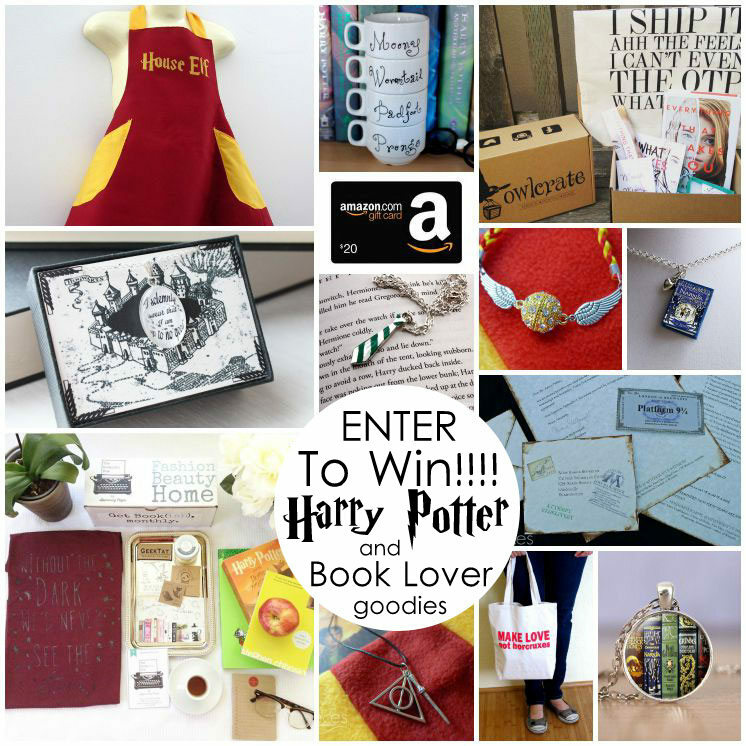 And if you weren’t with us last year make sure after you check out her butterbeer labels that you check out her fabulous Gryffindor bracelet tutorial. Another HHP returner is Michelle from The Scrap Shoppe Blog. Last year she made the most incredible Harry Potter Potion necklaces and this year she has a project just as great. 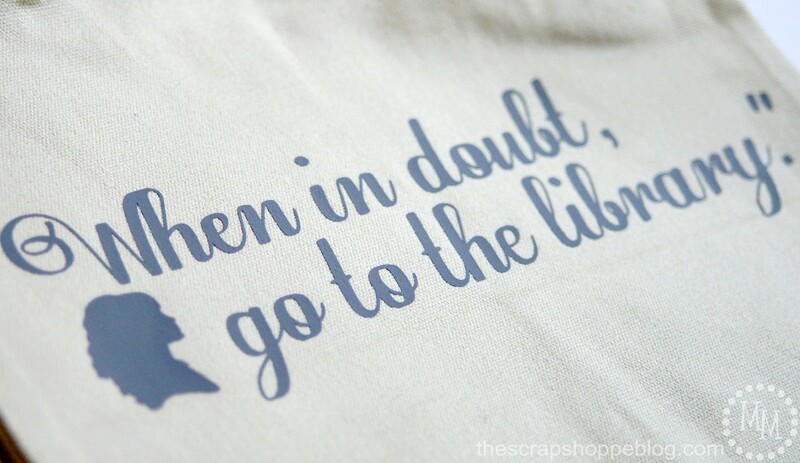 Her DIY Hermione library tote is absolutely amazing! She also has shared the file so it’s super easy to make your own. Did you know you could make your own temporary tattos? 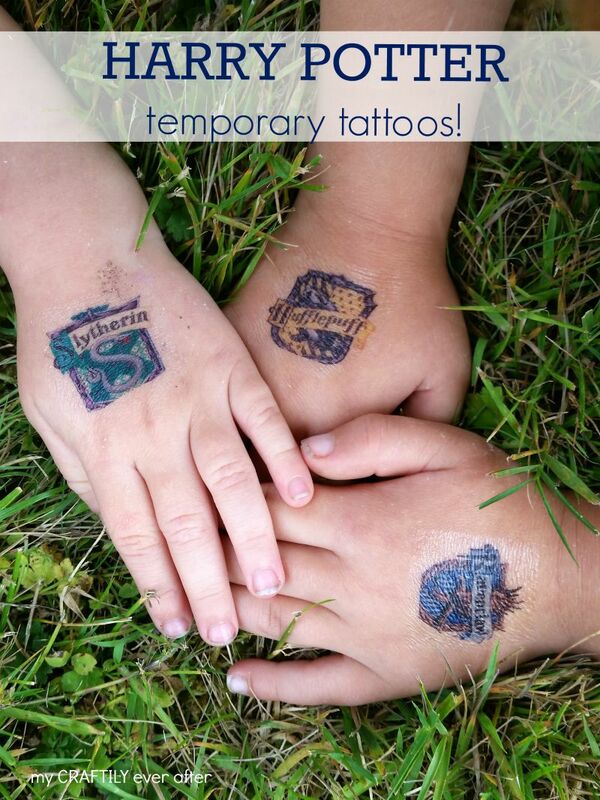 I had no clue so I flipped when Ashley from My Craftily Ever After shared her fabulous Harry Potter temporary tattoos. Aren’t they great? She also has a whole printable sheet of different Harry Potter designs that you can use to make your own tattoos. I know you’re not supposed to have favorites but Bev from Flamingo Toes is my one of mine for sure. She’s my partner in crime in our Sew Our Stash monthly challenge and fellow book loving crafty girl. She has another awesome hoop art project. 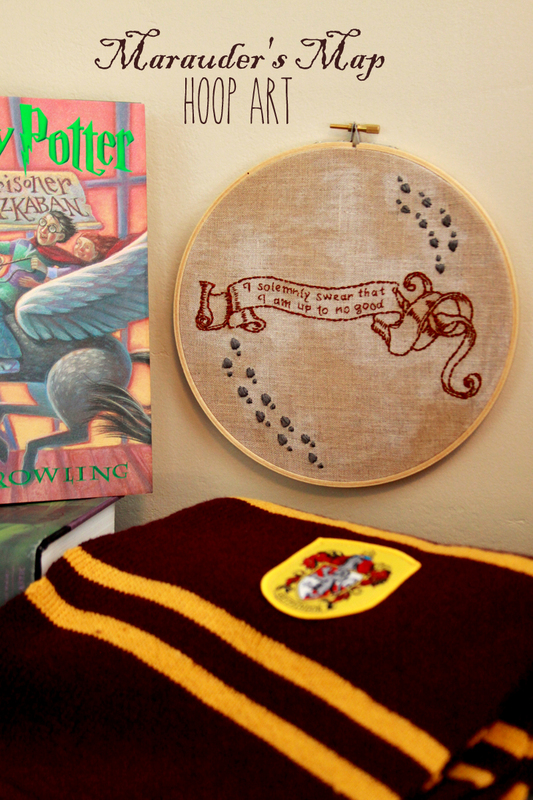 If you missed her cute Patronus hoop art tutorial from last year make sure you check it out after visiting her Marauder’s Map hoop art tutorial from today! 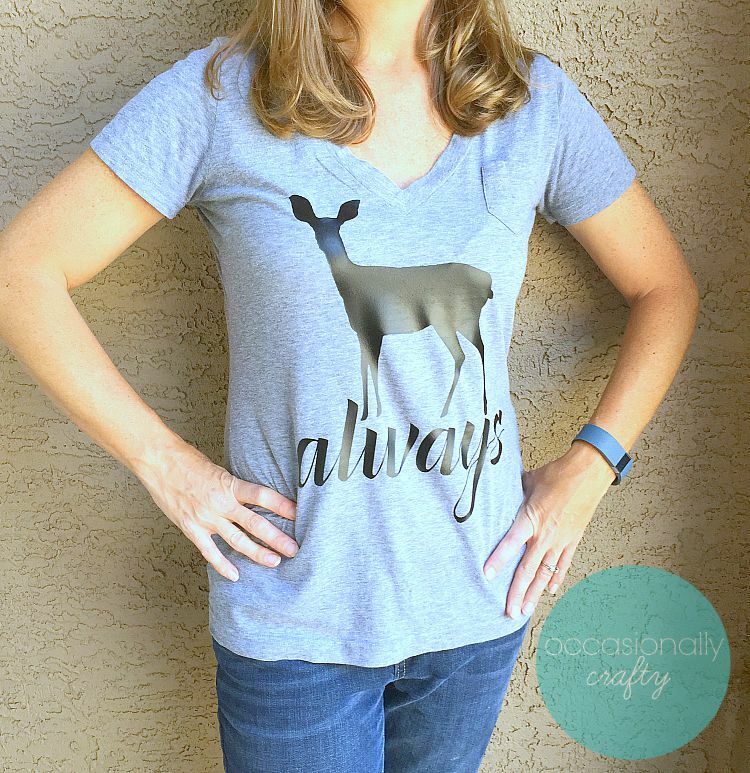 The great Valerie from Occasionally Crafty shared this super easy Always Graphic Tee tutorial. I love how clean and sharp the design is you could wear it with all kinds of bottoms. So excited to make my own! Last but certainly not least for Day 3 we have Heidi from Hand’s Occupied. 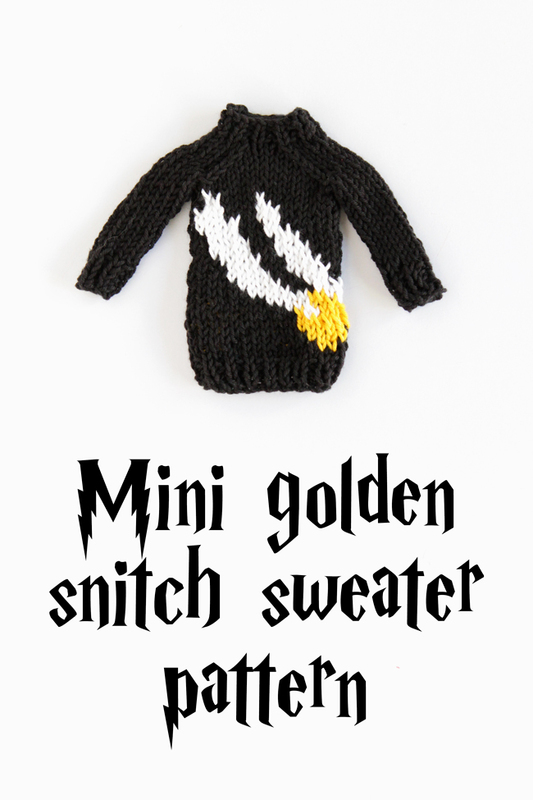 Last year she shared the most amazing tiny Weasly sweater knitting pattern and she’s at it again with this incredible Mini Golden Snitch sweater knitting pattern. Look at all that detail, goodness it’s amazing! Hop over to learn more. Day 3 projects are great. Now I just have to choose which one I want to do first. I feel like that’s the problem everyday! I’m having way too much fun. My favorite characters in Harry Potter were the weasley twins. My favorite thing about Harry Potter is just the enormity of what it’s done for the world. It not only inspired millions of people to start reading, it sparked it’s own music genre and fiction and plays and art and brought people together from around the world simply because of their love for this great series.